Xiaomi is the latest company to try and offer flagship-like phones at mid-range prices, and with the Mi 9 it pulls off the trick rather well. There are some shortcuts and some issues with the phone, but overall you're getting a fantastic Android handset for the price. Xiaomi's latest flagship phone is the Xiaomi Mi 9, launched first in China and now available across the rest of the world. The successor to the Xiaomi Mi 8, it immediately takes its place as one of the top phones of 2019 – something to consider as a competitor to the Samsung Galaxy S10 or the Pixel 3. Weighing the Xiaomi Mi 9 against its predecessor, the notch gets shrunk down to a teardrop shape, the internals get a performance boost, the bezels get thinner still and the rear-facing camera gets a major upgrade too. That triple-lens camera is likely to take a lot of the headlines and is one of the main reasons why you might want to go Xiaomi for your next phone. The handset runs Android with Xiaomi's own software on top, and comes with a relatively large 6.39-inch screen that gives you plenty of room for movie watching, web browsing, game playing and so on. We've been spending a few days with the Xiaomi Mi 9 and these are our thoughts on the device so far. We were expecting the Xiaomi Mi 9 to have launched in the UK by now, but we're still waiting... it's not available to purchase direct from the Xiaomi website or from any of the major retailers at the time of writing, though that should change in the coming days. What we can tell you is that the 64GB edition is already in sale in Europe for €449 (about £385), while the 128GB version costs €499 (about £425) on the continent. UK prices should be roughly in line with that, so we're talking about a flagship phone available at less-than-flagship-phone prices. Currency fluctuations aside, you should end up spending around £500 on the Xiaomi Mi 9. That puts it into direct competition with handsets from Huawei and OnePlus, and it's likely that the upcoming OnePlus 7 is going to be one of the main rivals to the Xiaomi Mi 9. If you're familiar with Xiaomi phones then it'll come as no surprise to learn that the Chinese tech giant has come up with a splendid slab of glass and metal here. The display bezels are pleasingly thin, the notch is pleasingly small, and the back is nicely curved and feels fantastic in the hand. A rather large camera bump spoils the aesthetics somewhat, but otherwise the Xiaomi Mi 9 ticks all the boxes from a design perspective. Its designs might be derivative, but they're certainly well executed. The phone is pleasingly thin and light too – a hair thinner than the iPhone XS and a shade lighter than the Samsung Galaxy S10 Plus, two phones that could be considered main competitors to the Xiaomi Mi 9. Even with a 6.39-inch screen, it still feels relatively compact, though you're going to need two hands to operate it most of the time. As well as the usual volume and power buttons on the right, there's also a dedicated Google Assistant button on the left, which saves you the trouble of actually having to say "hey Google" when you want something. You get a USB-C port and speaker grills at the bottom, and overall it's a pleasingly well built package – just bear in mind that it's slippy enough to slide off a surface, and the back is something of a fingerprint magnet as well. Note that this is a very shiny phone around the back (violet, blue and black are your colour choices): so much so that you can probably check your tie or your make-up in it. That might be a big pro or a major con for you, but it's something to bear in mind either way. You can't really have any complaints about the power and performance of the Xiaomi Mi 9 – at launch, the Snapdragon 855 is the best that Qualcomm has to offer, and is the same processor inside the Samsung S10 phones (expect to see a lot of the Snapdragon 855 in flagship Android phones this year). Pair that with 6GB or 8GB of RAM depending on your configuration and you really are going to be able to rely on this for years to come. The phone was easily able to take everything we could throw at it – we didn't notice any lag switching between apps and games, and the phone was comfortable with some of the most demanding games currently on the Play Store without overheating or running slow. We tried a quick blast of Asphalt 8 Airborne, for example, and the Xiaomi Mi 9 passed with flying colours. The loading times were nippy, the controls were responsive, and the high-resolution visuals shone – helped by that bright 6.39-inch Super AMOLED screen. With a resolution of 1,080 x 2,340 pixels and and aspect ratio of 19.5:9 it's not the sharpest, but it doesn't seem to matter: this is a top-quality display, with vivid colours, deep blacks, and plenty of brightness and contrast where it matters. HDR10 is supported too, for apps that can work with it (like Netflix). Whether it's browsing the web or watching a movie or two, the Xiaomi Mi 9 screen does its job admirably: it's perhaps not the very best screen we've ever come across but it's certainly in the top division and manages to impress. Colours really pop out and text is sharp and easy to read across your apps. The bezels are pleasingly thin around the sides of the display, and we've already mentioned the teardrop display that leaves plenty of room either side for status notifications and the like. The notch automatically gets out of the way when you're playing games or watching video in landscape mode, so your viewing isn't awkwardly impinged upon by a little black cut out. Out in bright daylight the display holds up well too, though you might have to ramp up the brightness to make sure everything is visible. The on-board Xiaomi software lets you adjust contrast and colour temperature settings, as well as switch to ambient brightness, where the brightness is automatically adjusted based on the light in the room. Speaking of the display, the phone comes with a "24 hour" dune wallpaper that changes through the day – another little feature Xiaomi has borrowed from Apple (specifically the dynamic wallpapers Apple includes with macOS Mojave). Pick up the Xiaomi Mi 9 and you've got a phone that's going to stay speedy and responsive for years to come. You can't really do better in terms of specs at the moment and the apps we used zipped along perfectly. That might change over time of course, but we reckon there's enough power under the hood to stop it from happening. The screen isn't quite as top-drawer as the performance but it's still has a premium, flagship feel and offers plenty to the overall experience of using the Xiaomi Mi 9. Camera quality is usually a key consideration for anyone picking up a new smartphone and the Xiaomi Mi 9 holds its own thanks to a 48MP+12MP+16MP triple-lens rear camera. Note that if you ramp up the resolution to the full 48 megapixels with the maximum detail, you lose some other features like HDR mode and portrait effects. Whether you go for the full resolution or chop it down, photos taken by the rear camera are really good for the most part. The phone will use some background AI processing to make pictures pop as much as possible, and in some situations we found the end results were more dramatic and intense than real life. It's not a big issue though, and the Xiaomi software gives you enough in the way of settings and tweaks to let you customise the image processing to suit your tastes. There's 2x optical zoom here, if you need it, but the pictures tend to be a bit more mixed in terms of quality than they are at the normal 1x zoom level. We found it was a similar story in terms of the HDR processing and the AI recognition that tries to pick the best settings for a shot while you're actually framing it. In our testing we found that these options didn't make too much of a difference, but they're easily ignored if you don't want to make use of them. The camera system coped relatively well with fast-moving objects and low-light scenes, though you won't get best-in-class results (the Pixel 3 phones are still the benchmark to beat in mobile photography, certainly as far as Android handsets go). The Mi 9 takes very good shots in most lighting conditions. Colour reproduction and sharpness is excellent, most of the time. Portrait mode lets you play around with blur and bokeh effects. HDR is available but doesn't make a huge amount of difference. The Mi 9 does well with close up macro shots. Colours pop and contrast is well managed. The Mi 9 can struggle in low light, but no more so than most phones. You can still get some usable shots if there's some light available. Photos taken with little light are still perfectly usable in most cases, but they don't impress as much as standard snaps do. As always with phone cameras, you're judging the photo quality against the price you're paying for the handset, and the value-for-money proposition of the Xiaomi Mi 9 isn't quite as obvious in night shots as it is for day ones. In other words, well-lit shots are noticeably better than photos taken by similarly priced phones, but darker shots not so much. It's a similar story as the display – the Mi 9 isn't quite the best in the business in terms of its camera, but the photos are still worthy of the flagship label. As is the norm for flagship phones these days, there's a Portrait mode for creating custom bokeh effects, and we found the mode worked as advertised, and quickly too. If you want to quickly put together something professional-looking with the minimum effort, the Xiaomi Mi 9 will do the job for you. The front-facing camera is a single-lens 20MP model, and features a couple of interesting options for group selfies – the phone will take several shots in a burst and then pick the one that's best (where everyone has their eyes open, say). The software can also correct distortion on faces that are near the edge of the frame, if you've got enough friends to actually fit the frame in the first place. The Xiaomi Mi 9 doesn't always take perfect photos but does take very good ones in the majority of cases. When you consider that its snaps can look as good as those taken on phones double the price, it's another tick in the positives column for the phone. We're happy to give high marks for the video recording here too – the Xiaomi Mi 9 can capture videos in 4K resolution at up to 60 frames per second. Audio recording can be a mixed bag, but that's not a problem exclusive to the Mi 9, and it's as good as you can expect from a smartphone in 2019. On paper the 3,300mAh battery packed inside the Xiaomi Mi 9 isn't much to write home about, but in actual day-to-day use it does a solid job of keeping a charge. At the end of most days we found ourselves with plenty of juice left in the tank – around 25 or 30 percent in some cases. That's better than most phones out there and is one benefit of sticking with just a 1080p screen. It also shows the power efficiency of the new Snapdragon 855 at work. Admittedly the Xiaomi Mi 9 isn't going to magically last for two or three days or anything like that, but it should comfortably see you through the day. Our test of an hour's Netflix watching at 50 percent volume and 100 percent brightness saw the phone's battery percentage drop from the maximum down to 90 percent, so you do the maths: roughly 10 hours of Netflix watching is a decent effort. When it's time to juice up the phone again you can choose from wired and wireless options and the faster charging specs are supported in each case (27W for wired and 20W for wireless). In practice we found recharging times really impressive – and it can come in handy when you need to shoot out the door in the mornings. The usual caveat about this being a brand new phone with a brand new battery applies again, but we reckon this is going to be one of the best handsets of the year in terms of battery life, especially if you can do some tweaking of the display brightness and so on. On the audio side there's just a mono speaker here, so Xiaomi isn't focusing on sound quality as much as some of its competitors. That said you get a decent amount of fidelity and volume from that single speaker. No one is going to use the Xiaomi Mi 9 to pump out the tunes at a houseparty, but when you ramp up the volume, it's perfectly acceptable for using the phone in speaker mode, or for filling a room with sound from a podcast, for example. That single speaker can get easily covered by your hand though, so you have to be careful when holding it if you don't want to suddenly mute the sounds coming from a movie you're watching or a game you're playing. It's in the software where Chinese manufacturers Xiaomi and Huawei sometimes let themselves down, and the MIUI 10 software running on top of Android 9 Pie continues the trend. It's not bad, exactly, but it's not as polished as stock Android or versions available from the likes of Samsung and OnePlus. In the absence of an app drawer, all your apps need to be on one of the home screens, though you can at least install an alternative launcher if you want (and bring back the app drawer along the way). You get a bunch of Xiaomi Mi-branded apps on board, from a browser to a calculator, and while they're easy enough to ignore (and replace with better-known alternatives, if you want), they hardly add much value to the overall Xiaomi Mi 9 package. The MIUI 10 software does add the option of a dark mode, which you might like and which won't be natively supported by Android until Android Q rolls out. The OS does come with a impressive number of other settings and options too, though it's debatable how many you'll actually get around to using. There's the option of an always-on display here, which is something we like to see in our phones, and it's easily customisable too, which helps – you can restrict it to certain times of the day, for instance, if you're worried about battery life. 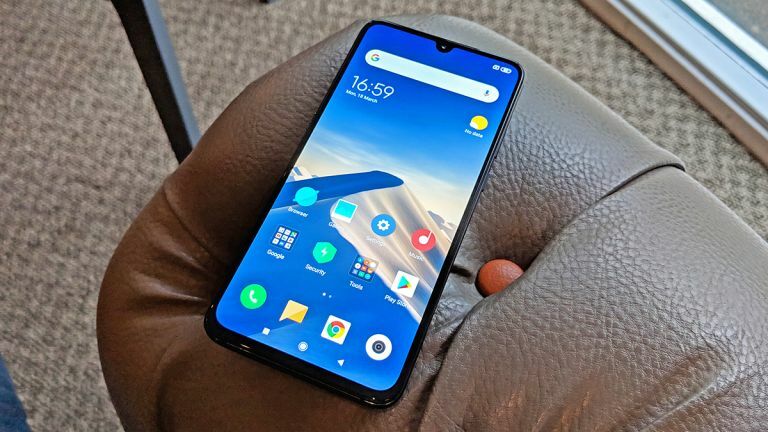 We still think the MIUI software is one of the weakest parts of the whole Xiaomi Mi 9 experience, but it's not bad enough to put us off the phone – just don't expect the same amount of polish as the Android editions put out by the likes of Samsung and OnePlus. As well as the usual pattern and PIN login options, the Xiaomi Mi 9 comes with an in-screen fingerprint sensor. It's not as sharp and responsive as a physical button but it does the job well enough, and we actually prefer having a fingerprint scanner to using Face ID or a similar system (your mileage might vary here). Every phone review has to balance the quality of the handset against the price you pay for it, and the Xiaomi Mi 9 ends up looking like a very appealing package – it's now outdoing OnePlus in terms of offering flagship features for a price that's significantly below what you'll pay for other top-end phones. It's not cheap, exactly, but it's a really good value-for-money proposition if you don't want to spend close to £1,000 (or your local equivalent) on upgrading to your next handset. We like the polished, elegant design of the Xiaomi Mi 9 – it really looks the business and feels comfortable to use. The screen quality and the camera performance are both really good without being best-in-class, and the battery life is better than you might expect as well... all key considerations for buying a phone in 2019. To get to this price point, Xiaomi has cut a few corners though: there's no waterproofing here, and no memory card slot for expanding the on-board storage. Also, you might not still be looking for a 3.5mm headphone jack, but the Xiaomi Mi 9 doesn't have one (you do get a USB-C dongle in the box). The MIUI 10 software is better than previous versions but continues to be a bit hit and miss too. It's not the most appealing version of Android we've used and you might be waiting a while for future updates. Overall though, the Xiaomi Mi 9 comes out well in credit when you weigh the pros against the cons. If you're looking for a phone with flagship performance and looks, but don't want to pay the sort of prices a Galaxy or a Pixel commands, then the Mi 9 should definitely have a place on your shortlist.